The Starch Solution starts out the same way as all of these low-carb books: professing the health benefits of this superior diet, without having to count calories, while the public health boards are asleep at the switch having been captured by the other side! This is amazing because it is basically telling you to eat the exact *opposite* of what the low-carb books suggest, and yet both sides argue that their diet is the healthy one! Low carb proponents say meat/eggs/oils(unheated) are good for you, while this book says they cause terrible things like cancer. This book says starches and enough sugar to improve your meal's taste is good for you, while low carb proponents say those cause terrible things like cancer! It's kind of amazing that people can look at the exact same evidence (the body of work before them in the fields of nutrition and biology etc.) and come to exactly opposite conclusions. Confirmation bias is a hell of a drug! As a total layman, I now have no idea what to believe. I guess I have to get into the research papers on this subject myself, or find a book that explains/balances the pro and anti arguments in a way that is easy to understand. I currently still lean positively towards the low carb point of view, because it makes the most sense to me that we would have evolved with a preference to this diet seeing as how much of human existence has been as hunter-gatherers. But this book argues that during that period, we ate mostly starches! So I guess I have to at least keep my mind open to this possibility. My point of view may also be biased because I do enjoy low-carb meals and have successfully pulled off a lot of weight loss using it (so it would be great news for me if this was in fact healthier! ), whereas I would have a lot of (taste) problems with the meals suggested in this book. That chart is not incontestable evidence that calcium intake causes hip fractures. 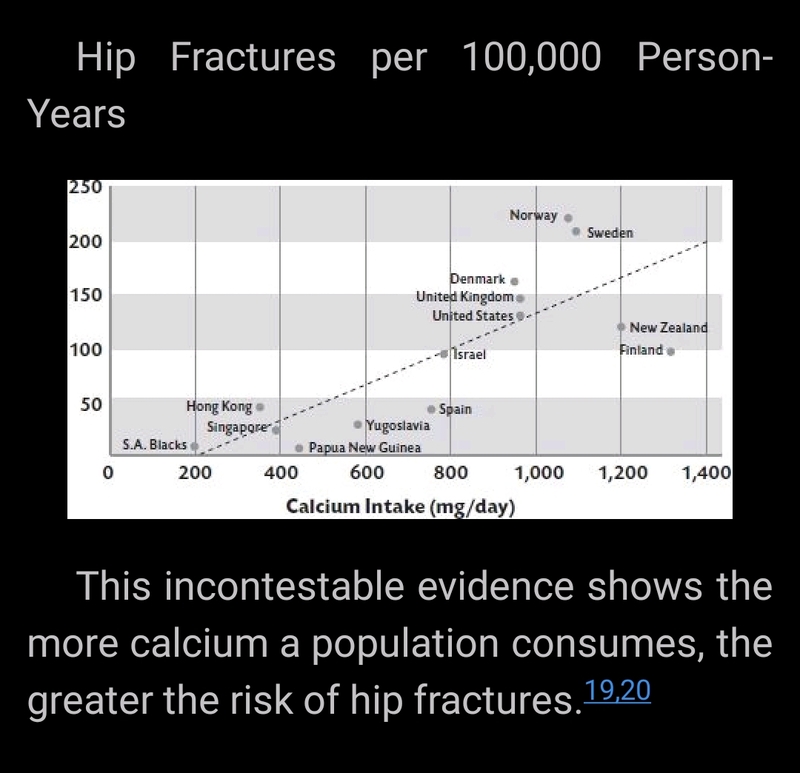 Those countries (even assuming they were not cherry-picked for somewhat fitting that line) may have a lot more closer correlations with hip fractures from other factors, like sugar or processed food intake. There were also some Malthusian-sounding arguments about how we just can't support a global meat-eating population, and some chapters that suggest his preference for non-meat foods goes beyond nutrition. He also argues that we eat too much cholesterol. I believe the latest research indicates that blood cholesterol levels are not related to dietary cholesterol levels, but he doesn't go into why he believes that conclusion to be wrong. I do think this diet works though, at least on some. There are too many testimonials from people who have lost a lot of weight. This brings me to a point my doctor made, which is that it's fat and carbs *together* that make people gain weight. It would seem that fat without carbs, or carbs without fat, do seem to keep people from being fat. Whether one is more healthy than another is I guess what I need to study more. There are some things that both this book and the low carb books argue: salt is no big deal, eat til you're full (i.e. don't count calories), and that you should stay away from highly processed foods. I suspect avoiding processed foods alone would improve the diet of the average North American significantly. I've also read another book that suggests a similar diet to this one, called The China Study: The Most Comprehensive Study of Nutrition Ever Conducted and the Startling Implications for Diet, Weight Loss and Long-term Health . But then I read Denise Minger's take-down of the book and it was amazing. It has been a few years, though. That's probably where I should start to better understand the arguments from both sides. by Schwingshcakl et al. Available at the link as a pdf. I have figure 2 printed out and stuck to my fridge to keep me on the right track. Interesting that some contentious food groups (eggs, dairy, fruits) are healthy eaten in small amounts before becoming associated with increased mortality. I enjoy your blog so hope you find that helpful. hi barel, thanks for sharing. I enjoy your blog also. Here is something that has made sense to me. Michael Pollan synthesized his research and his books into this 7 word sentence, "eat food, not too much, mostly plants". - food, as per him, is stuff that goes bad and stuff our grand parents would recognize. processed food is somewhat disqualified as a result. - not too much, I believe, refers to conservation of energy - if we eat more than we need, it will cause the body to store it somehow, not something human bodies are very good at over the long term. - mostly plants - not sure of the logic, but I like to believe that plants offer more fiber and therefore help us eat less by filling us up with fiber. His seven word sentence also seems to agree with what has happened over millennia. Processed food (with modern chemicals) was absent, food availability was scarce, and presumably plants were easily harvested compared to meat. You read a lot - would love to get your assessment of the above. Petter Attia has had some good bits on this as well.